Welcome to part 2 of my Body Beautiful post. In case you missed my first post yesterday, this is the second part of a blog post discussing how mums feel about their post baby bodies. In part one I discussed how I feel about my own body. I know a lot of mums feel certain pressures to lose weight once they’ve had a baby. I would say the majority of pressure comes from society and the media, which in turn causes mums to put a lot of pressure on themselves. A newborn is exhausting, and you can barely remember your own name sometimes, but many new mums still feel that pressure to start thinking about getting back in shape just a few weeks after giving birth. I can’t say I was one of those – I didn’t really give it a second thought until a few months after having Alfie, and that was more because I wanted to use exercise as an excuse to get out of the house and have a bit of me time! I was pleasantly surprised with the responses I got. There were a few ladies who said they didn’t feel confident in their post baby bodies, because they had put on a lot of baby weight and struggled to lose it. Some ladies said that it wasn’t about how *much* they weighed, it was more to do with how they felt in their own skin. However, even though they didn’t feel particularly body confident, they all agreed that their bodies were amazing for giving them the child(-ren) they had, and for that they could never hate it. I absolutely love that mentality, and I think it’s something new mums need to remember if they are worrying about how they look – your body has gone through a massive ordeal in pregnancy AND labour, and no, it might not be the same again, but it really doesn’t matter when it’s given you such a blessing. However, I have to say the majority of women were so positive about their bodies. Many of them were like me and said they didn’t *love* the way they looked as it was quite different from how they looked pre-baby, but they didn’t hate it, and they totally respected their bodies now. 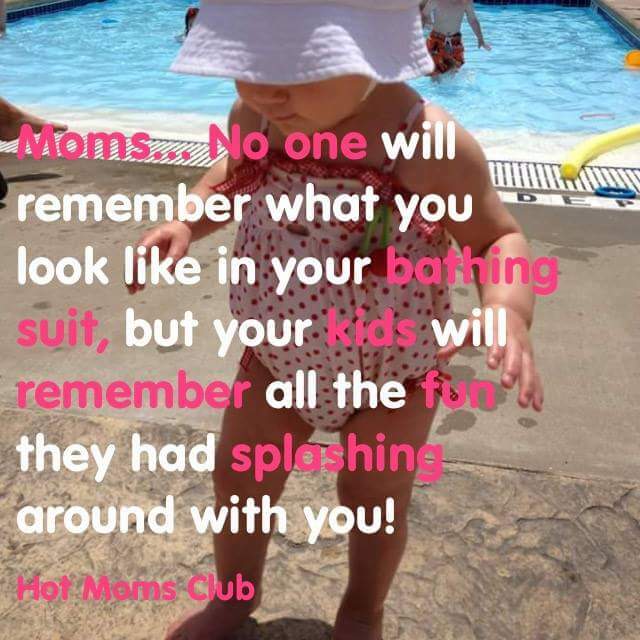 I have to say I was so happy reading all their comments about how they felt about their bodies, and it really made me quite proud of all these mums who were celebrating what was important – that they were mums and that made them beautiful! I asked them to be honest with me, and I believe they were – no-one sugar coated how they felt, they all admitted there were some things they didn’t like, but they also said they couldn’t care less about it! As long as they were healthy and their children were happy and healthy, that was all that mattered in life! Some said they would wear a bikini because they didn’t care, some said they wouldn’t because they didn’t feel comfortable, but that doesn’t define them and mean they are ashamed of their bodies! A few even said that reading all the positive comments had encouraged them to possibly think about wearing a bikini and being proud of it! So all in all, I would say we are a proud, positive, beautiful bunch of mamas! We can see that it doesn’t matter what you look like, only what you feel like – we feel like supermums! This post is sprinkled with some fab quotes made by these wonderful women, and will hopefully install some confidence in all those new (and not so new!) mums and help you to realise that you are beautiful.